Villiers Statue: 1878. By W. Theed the Younger. Clock Tower: 1883. Cast iron on ashlar plinth. Bridge over Lake: 1880. Cast iron with ashlar abutments and piers. Conservatory: 1896. By Dan Gibson. Walls, railings, gates and piers: 1880. By Bayliss Jones and Bayliss. The Chalet, South Lodge, North Lodge, South Shelter, the Erratic Boulder. Parks and Gardens of Special Historic Interest: English Heritage maintains a list of Parks and Gardens of Special Historic Interest. This is not a statutory list and has no direct legal effect in preserving historic parks and gardens. But, as English Heritage says, the function of the register is "to draw attention to important historic gardens and parks as an essential part of the nation's heritage. 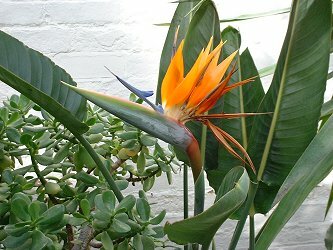 If their existence is not widely enough known, they could all too easily be overlooked, for example in plans for new development". In the case of West Park - whose actual existence is pretty widely known - the register acts to draw attention to the fact that West Park is valuable not just as a recreational area but also as part of the heritage. "Designed by R H Vertegans and laid out 1879-81, opened to the public 1881. 8 entrance gates and railings c.1880, statue of Sir Charles Pelham Villiers 1878 by William Theed the younger, and Clock Tower 1883, both near the centre of Park. Bandstand c.1883 to west. 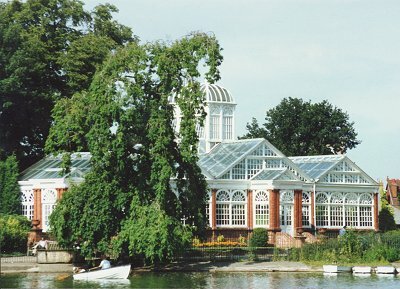 Conservatory by Gibbs 1897 to north of lake. "West Park is roughly oval in form, and is bounded by Park Road East and Park Road West. Paths from 4 of the 8 entrance gates converge on a central area, with a circular parterre. 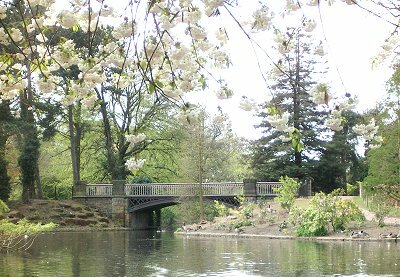 The northern half of the park contains a lake, nipped at the centre, and crossed at this point by a bridge. The east and west sections of the lake each contain [sic] an island. Wildfowl collection. Perimeter path and serpentine walks link main features of interest. Numerous mature trees. Extensive rose garden. Tennis courts to east. Southern area of Park more open. Parked noted since inception for remarkable displays of seasonal and tapestry bedding". Pevsner notes the park and its features, describing the park as "an effective and largely informal layout with a lake". There are accounts of the creation of the park in Upton's history and pictures of it in many of the modern picture histories. Since the Park was a well loved and much used place, as well as being decorative, there are hundreds of different postcards showing it and they can be found in any collection. The City Archives contain many pictures of the park. Note: the park is about 50 acres in extent, of which the lake occupies about 8 acres. The land was originally a boggy area, practically marsh, and was known as Hungry Leas - "hungry" being a not uncommon name applied to land which was of little or no use for agriculture. The name probably changed to Broad Meadows when it was leased from Lord Darlington (later the Duke of Cleveland) for use as a race course and drainage was installed. It was first used as a racecourse in 1825 and so continued until the lease came to an end in 1878. The town council, who had been looking for a site for a park, stepped in and got a lease for a period of 63 years at an annual rent of £300 for the first 42 years and then £350 for the remainder of the time. But the lease contained an option to purchase and this option was duly exercised. Despite some drainage the racecourse had remained rather boggy and the park's lake was an essential feature in sorting out the drainage. (There was then, for some years, no race course in Wolverhampton, though some races did take place on Alexander Staveley Hill's property at Dunstall. When the railway came through that estate, Hill moved out to Oxley Manor and sold the remaining land to a racecourse company set up by the local racing fraternity. After many delays racing started at Dunstall Park in August 1888). During the last ten years or so there was much debate about the future of the park - what, after all, was the function of a park in a modern city? The question now seems to have answered itself, as people continue to use the park for its traditional purposes, and as it has been recognised as having historical and heritage value as well as being a beautiful garden. The Heritage Lottery Fund provided £2.2 million for a complete refurbishment scheme, which includes renewing many of the beds as well as many of the buildings. By 2005 most of this work was complete and the park is now looking fine - only a few shrub borders need a bit more time to grow. Here follow notes and pictures of some of the park's features. The exterior appears in the photo at the top of this page. 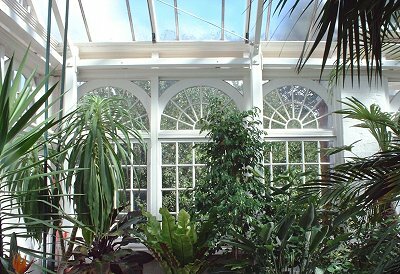 The conservatory was built from the proceeds of the Wolverhampton Floral Fetes. The architect was T. H. Mawson of Windermere; and it was built jointly by Richardson & Sons of Darlington and Henry Gough, a very large, Wolverhampton-based, builder. 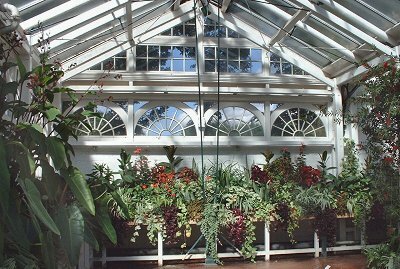 The conservatory was once famous for its display of chrysanthemums. Now, splendidly restored, it contains both tropical and desert plants, despite the area not being large and the automatic temperature control system not working too well. 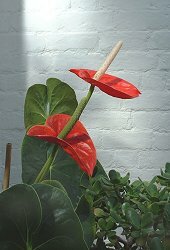 The hope is that the plants reflect the varied cultural heritage of present day Wulfrunians and that they will be useful for teaching purposes too. Inside there is a Blue Plaque recording the original building and the restoration. The band stand was the gift of the Rt. Hon. C. P. Villiers (see below) who is said to have declined an invitation to come to the opening of the park but sent the bandstand instead. From The Builder, 1st July 1882. 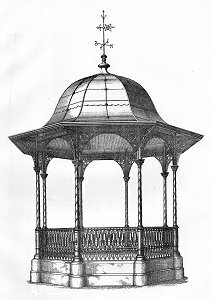 "The Builder", in 1882, reported that the bandstand "was inaugurated with considerable demonstrations on Whit-Monday". The drawing shows its original state, before it was "greatly enlarged" sometime before 1901. 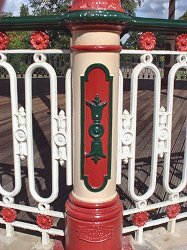 The dimensions given for 1882 show that the eight cast iron columns were 16ft high, the ornamental railings were 3ft 9in high, the height to the top of the vane was "about 35ft", the diameter over the pillars was 20ft and over the eaves was 28ft. A ceiling of "varnished pitch-pine ... acts as a sounding board". The original design of the park did not allow for a bandstand and the whole area had to be remodelled. 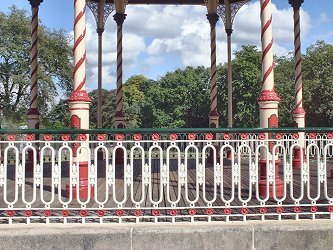 The bandstand was given a 9ft wide border of "flowers and trees" with a wire fence around it; and, outside that, there was "a circular gravel walk 30ft in width with five other walks, each 20 ft wide, radiating therefrom to the main roads in the park". The cost of the stand itself was £225, the base and flooring cost £78 and the painting cost £37. 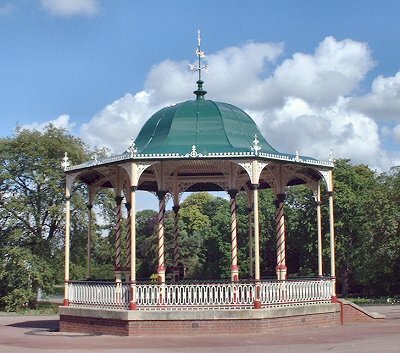 The bandstand was made by Steven Bros & Co of Glasgow and London; the stone base was built by Bradney & Co of Wolverhampton and the painting was done by "Mr. Hartill of Worcester Street". And the whole operation was carried out "under the personal superintendence of the borough surveyor". The enlargement of 1901 clearly consisted of the addition of the outer set of (plain) columns and seems to have included replacing the stone base with a brick one. In 1911 electric lights were added to it at the cost of about £30. Sometime before 1902 Edwin Butler left £5,000 in his will, the interest to be applied to providing music in the park. The lake is said to cover 8 acres. In the smaller part, beyond the bridge, there is an abundance of water fowl. There are fewer of them in the larger part but in the summer there are rowing boats for hire. Unfortunately most of the water fowl are now Canada Geese and the other, smaller, species which were once plentiful, seem to to have moved out.